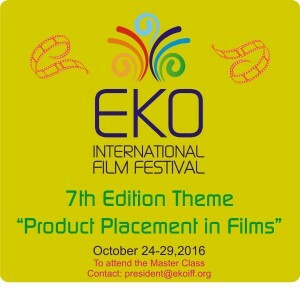 ‘Product Placement in Films’ is the festival theme of 2016 Eko International Film Festival coming up October 24-29,2016. The festival theme will be one of the major discussions during the Eko International Film Festival Master Class. Participants will come from the film industry especially film directors and producers and professionals from companies – multinationals. The master class conversation will help filmmakers leverage on company brands around their demography in collaborating in film business. The on two days master class will be debating on how filmmakers and product and servicing companies can work together in promoting their brands through films. Master classes offer an opportunity for renowned directors to share their screen experience and memories and dialogue with an audience of film lovers. We look forward seeing you during the Master Class.